RadTileElement represents a simple tile which can contain text and image and acts like a simple button. You can also add other elements to its Children collection programmatically. To set the location of a tile, set its Column and Row properties either at design time or via code. 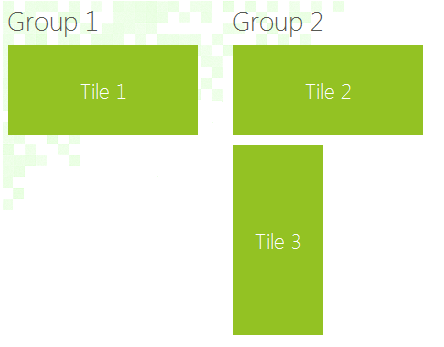 These values are zero based and describe the location cell in either the main panel or the group in which the tile is placed. RadPanorama uses dynamic number of columns, so you can set the Column property of a tile with a value, greater than the ColumnsCount value. However, setting the Row property with a value, greater than the RowsCount value, will result in an exception. 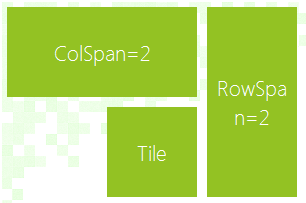 To change the span of a tile, set its RowSpan and ColSpan properties. The RowSpan property specifies how many cells of the row should be occupied by the tile. The ColSpan property specifies the number of cells in each column which the tile should occupy. 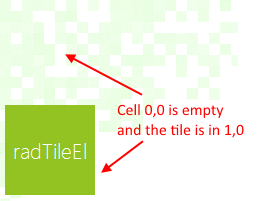 The CellPadding property specifies the offset of the tile according to the bounds of the cells. The following code snippet demonstrates using the RowSpan, ColSpan and CellPadding properties. RadLiveTileElement extends the functionality of RadTileElement by providing means of displaying content that changes on a specified time interval. Text = "Movie Idea: Pirates of the Carribean"
Text = "Movie Idea: Inception"
Text = "Movie Idea: The Expendables"
Text = "Movie Idea: Harry Potter and the Deathly Hallows"
You can find below a sample code snippet demonstrating how to add groups to RadPanorama and fill the groups with tiles.